The Common Nutmeg sea shell is small, only 1 – 2 inches long, or slightly larger. You will find them while beachcombing along the southern U.S. coast from North Carolina to Texas and also in the waters of Brazil. The bumpy little shell contains spiral cords crossed by ribs which give it a latticed look. It’s nicely colored with dots of orange brown color on white. 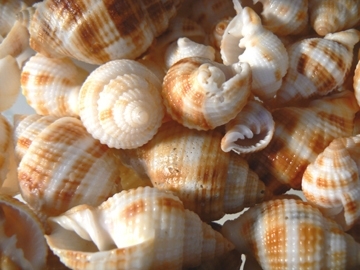 The opening is lined with strong ridges where many shells have a smoother opening. 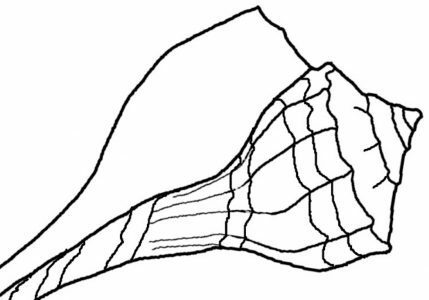 If you want a more scientific explanation, search for this shell by it’s Latin name (Cancellaria reticulata). Click here for more pictures. I don’t have any of these shells in my collection and the photo above was sent to me by Mike at Florida Sheller, a blog page with more photos of his Florida sea shells.